"Cool Cord Individual Friedship Maker". From our "Make It Cool" Line this individual bracelet maker will give you hours of fun. 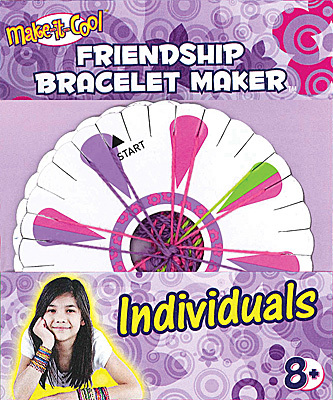 Our Friendship Bracelet making kits make the best camp or school activities, party favors, gifts & gift bag stuffers. Kit Includes, 1 pre-strung, reversible / 2 pattern weaving wheel & easy to follow instrictions.